Loma Performance seems to think that its new BlackforceOne Corvette is somehow evocative of POTUS' personal airplane. "Clearly reminiscent," they go so far as to say in their press release. (We think the moniker sounds as if could have been the title of a 1970s action film starring Fred Williamson.) Anyway, labored connections to the Prez's 747 aside, with the BlackforceOne, Loma appears to have come up with something pretty tasty. 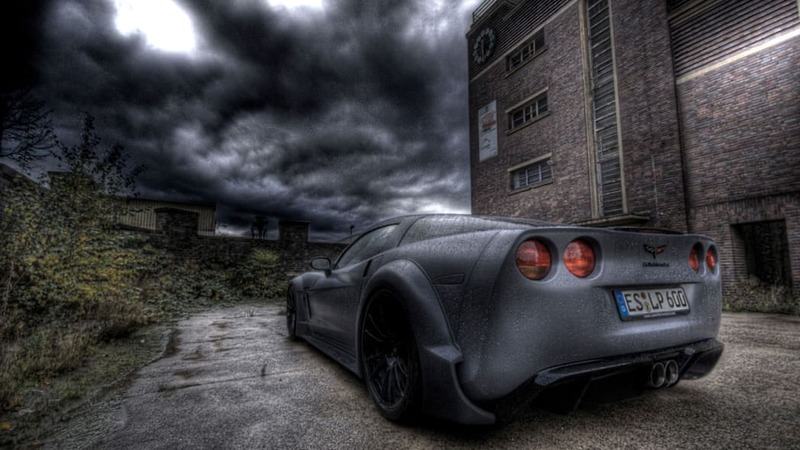 It starts off as a base-engined C6 Vette, which is subsequently twin-turbocharged to make 783 horsepower (794 PS). Of that, a devilish 666 hp (675 PS) or so actually make it to the rear wheels. Accordingly, the sprint to 100 km/h (62 mph) takes a scant 3.4 seconds, and the top speed is 205 mph (330 km/h). The stock brakes are replaced with carbon-ceramic discs all around, and the suspension, wheels, tires, exhaust and other drivetrain components are also upgraded accordingly. 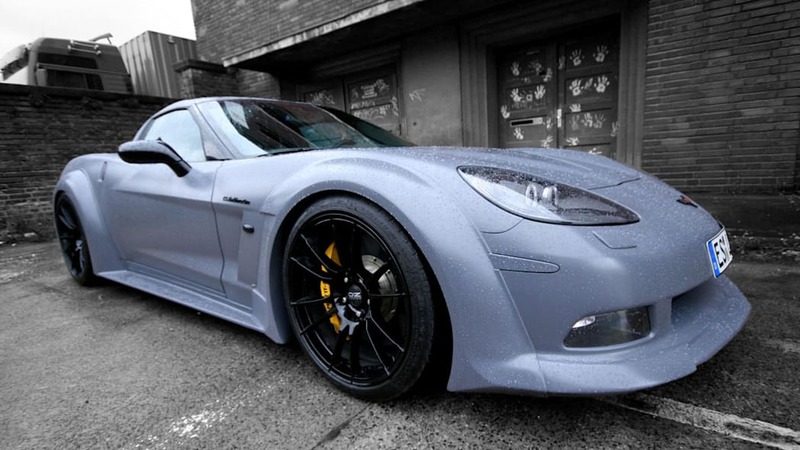 The package is then wrapped in a widebody kit drenched in one of three matte paint finishes. Production will be limited to 25 examples, according to Loma, which will formally unveil the BlackforceOne at the Essen Motor Show. 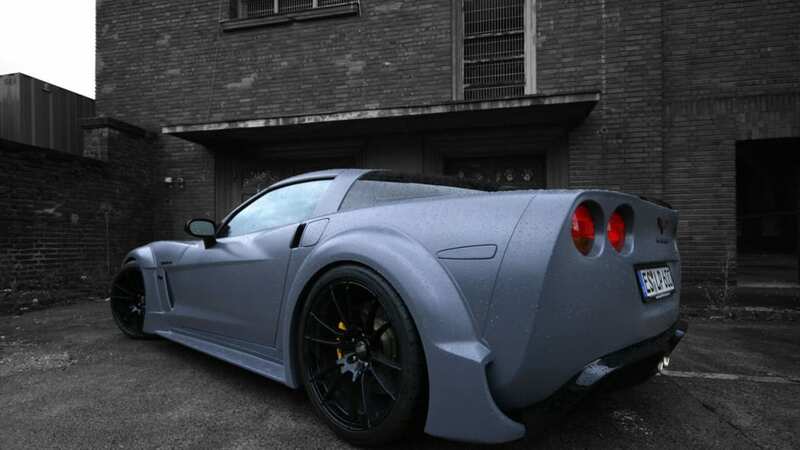 No less than two metres from outside wheel to outside wheel, the C6.BlackforceOne is based on the "normal" Corvette (original width: 179cm) and not on a Z06 or ZR1 model. This means around ten centimetres more on each side and creates a real masculine feel. LOMA-Performance makes no effort to disguise the source of the additional width - indeed clearly and stylishly displays the carbon fibre wheel arch extensions and carbon fibre side skirts available with or without visible screws: the ultimate racing look. LOMA has installed a carbon fibre front lip and rear diffuser with integrated LED reverse light alongside the extensions, also in carbon fibre. The optional LOMA-Performance rear spoiler with a carbon fibre finish is easy to fit and detach. Circular daytime running lights are an eye-catching feature of the headlights. 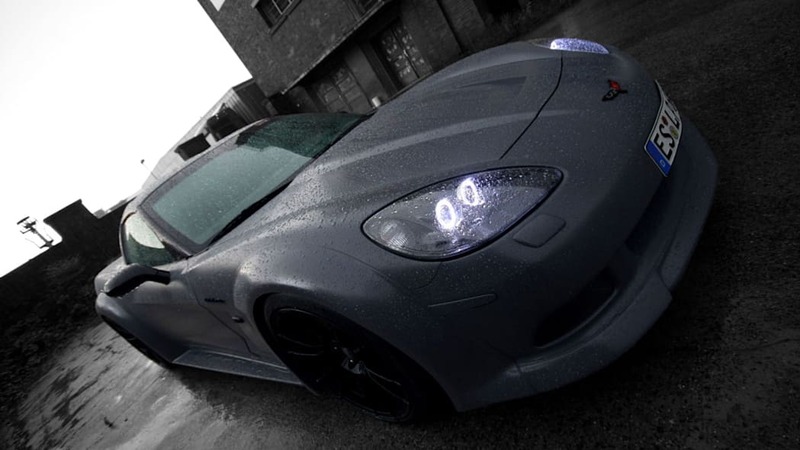 The front lip, rear diffuser and daytime running lights are incidentally available for all C6 Corvettes, including the Z06 and ZR1. The bi-turbo engine conversion is, however, exclusive to the C6.BlackforceOne and raises an incredible 794 PS from the V8 engine. 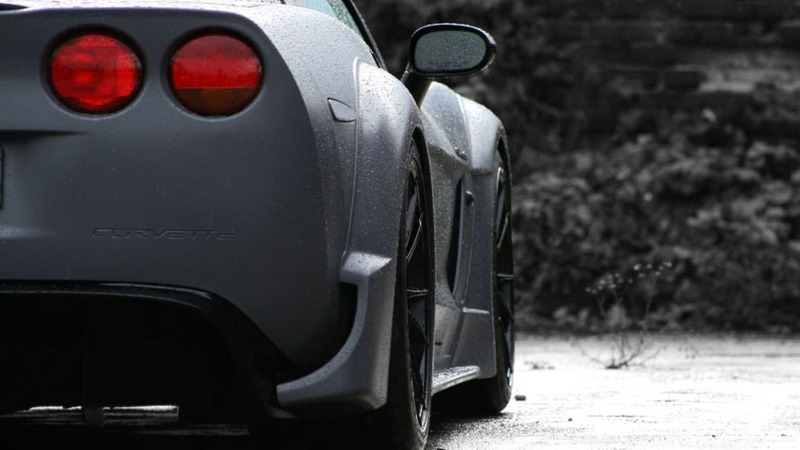 675 PS still reach the rear axle after transfer via a LOMA-Performance carbon fibre sports clutch, highly durable carbon fibre drive shafts and an overhauled gear unit; skilled hands are certainly needed at the wheel of the high-speed Corvette. It should hit 100km/h in just 3.4 seconds to furious roars from the LOMA Cup Sport Superlight exhaust unit and reach 330km/h. "Only" 330km/h? Yes, that's right, because LOMA believes in good acceleration in all situations rather final speed as a status-symbol, and has adjusted the C6.BlackforceOne accordingly. A propos adjustment: coilover suspension is fitted beneath the body to allow separate adjustment of pressure and rebound damping. Even the stabilisers are adjustable. An extra 8 centimetres' tread at the front and all of 14 centimetres at the rear ensure the C6 really hugs the road. The impression of sheer unlimited curve speed is of course also down to the Michelin Sport Cup high performance tyres in the dimensions 275/30R19 and 335/25R20 mounted on 10 x 19 and 12 x 20-inch shining black OZ Racing Ultraleggera HLT alloy wheels. LOMA-Performance can install a carbon fibre/ceramic brake unit from Mov'it for brutal deceleration to match the brutal acceleration. This is an impressive 15.5 kilograms lighter on the front axle and 10 kilograms lighter on the rear axle than, say, ZO6 brakes. In the interior, too, the team headed by Managing Director Mario Radosavljevic have been hard at work creating a great ambience with both technical and luxury features. The door panels, for example, are finished in carbon fibre and sections of the cockpit are covered with Alcantara. C6.BlackforceOne customers can choose from 300 different types of leather. The sports steering wheel - 34 centimetres in diameter with Alcantara - is smoothed off on the underside; the refitted seats with shoulder rests are only half as thick as their series equivalents. Special foam ensures these ultimate sports seats are still comfortable and great for long journeys. All electrical functions have been retained as has full airbag functionality. 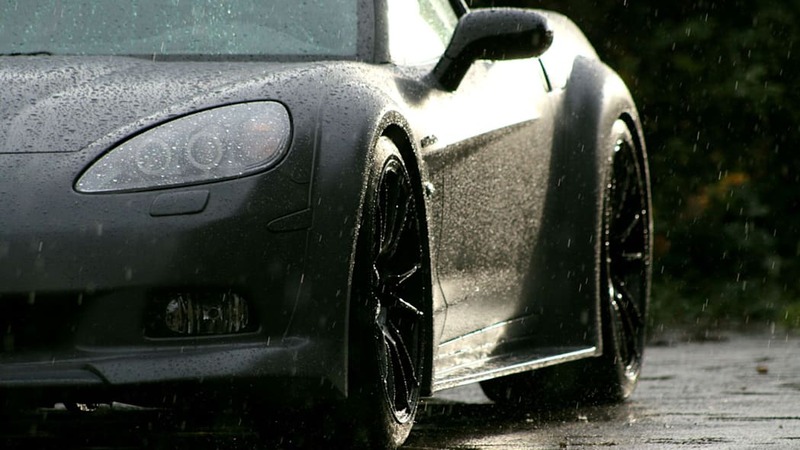 C6.BlackforceOne production is strictly limited to 25 vehicles. All are numbered and come with a full guarantee. LOMA provides an additional 12-month guarantee for the spectacular engine tuning. The prices for a complete vehicle start at 190,000 euros. Those who want to experience the monster live will find it at the Essen Motor Show from 28 November to 6 December (Hall 6, Stand 215).